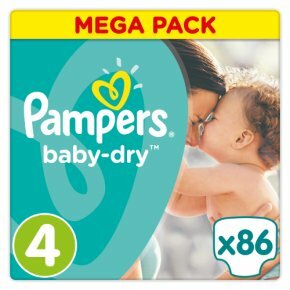 Pampers are up to 2 times drier. Pampers are drier faster: Ordinary diapers can stay damp, Pampers are drier faster. Absorbent Micro Pearls: Absorb up to 30 times their weight and help lock wetness better. Top Dry-Layer: Always in contact with your baby\u2019s skin, designed to dry up as fast as possible. Flexible Sides: Provide a comfortable fit for great overnight leakage protection. Breathability: With micro pores enabling vapor to travel from the inside to the outside of the diaper to help your baby\u2019s skin stay dry. Available in sizes 2, 3, 3+, 4, 4+, 5, 5+ and 36.Babies can\u2019t tell you how they slept or if their diaper was damp. Ordinary diapers can stay damp, but Pampers are drier faster. For up to 12 hours of undisturbed sleep and nothing but happy babbling mornings. Pampers are up to 2 times drier. Pampers are drier faster: Ordinary diapers can stay damp, Pampers are drier faster. Absorbent Micro Pearls: Absorb up to 30 times their weight and help lock wetness better. Top Dry-Layer: Always in contact with your baby's skin, designed to dry up as fast as possible. Flexible Sides: Provide a comfortable fit for great overnight leakage protection. Breathability: With micro pores enabling vapor to travel from the inside to the outside of the diaper to help your baby's skin stay dry. Available in sizes 2, 3, 3+, 4, 4+, 5, 5+ and 36.Babies can't tell you how they slept or if their diaper was damp. Ordinary diapers can stay damp, but Pampers are drier faster. For up to 12 hours of undisturbed sleep and nothing but happy babbling mornings.